BRAND NEW DVD Sleepless in Seattle MEG RYAN TOM HANKS 10th Ann. Edition. 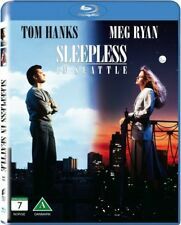 80 product ratings - BRAND NEW DVD Sleepless in Seattle MEG RYAN TOM HANKS 10th Ann. Edition. MEG RYAN AUTOGRAPH THANK YOU CARD FROM THE MOVIE "HANGING UP"
Meg Ryan Collection 4 Film Favorites DVD - New! 1 product rating - Meg Ryan Collection 4 Film Favorites DVD - New! Trending at $2.91Trending price is based on prices over last 90 days. Meg Ryan & Billy Crystal Own The Moments 3 Film Collection DVD - New! Trending at $7.29Trending price is based on prices over last 90 days. "Kate & Leopold" (DVD) Meg Ryan, Hugh Jackman, Liev Schreiber. Brand New.